Heat up some oil and fry the onion and chili together, add sardines including the sauce. When it is boiling, turn off the fire. Add the lemon juice into it before to serve. 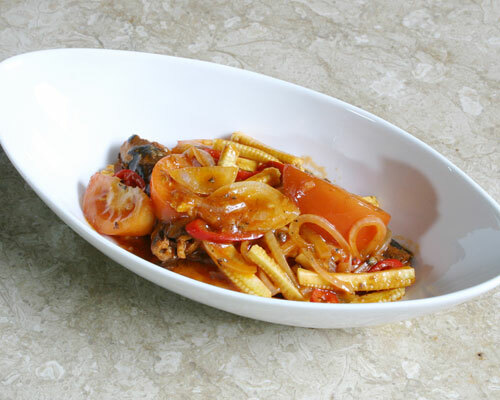 This dish can be eaten just like this or you can serve it with rice, noodles or pasta! Comments: This recipe is high in Vitamin C, an important vitamin & a potent antioxidant that protects against stroke and heart attack by lowering blood pressure and LDL ("bad cholesterol") levels. It also aids the absorption of iron present in the dish. Beef up your protein by enjoying this dish as is an important building block of bones, muscles, cartilage, skin, and blood. The saturated fat content in the dish is outweighed by the benefits of good fats, Omega 3 & 6 in the dish.